On Tuesday, July 31st 2018, H.E. Dr. Yue Xiaoyong, Chinese Ambassador to Ireland, met with Mr. Conn Murray, Chief Executive of Limerick City and County Council. Mr. Murray said that, he was, on behalf of Mayor James Collins, honored to meet Ambassador Yue as the first Chief Executive after the merging of Limerick City Council and Limerick County Council, and it was a great opportunity to learn more about China’s recent development and enhance exchanges and cooperation. The economy of Limerick enjoys a sound development momentum with GDP growth ranked top 10 among all European cities. Currently Limerick is committed to expanding foreign trade market and developing relationships with cities and regions especially with those in China. He expressed strong willingness to strengthen the bilateral cooperation in fields as economic and trade, medical technology, digital industry and culture. Mr. Murray also briefed Ambassador Yue the positive progress achieved in the exchanges between Limerick and the city of Hangzhou. Responding to the Chief Executive, Ambassador Yue briefed achievements of China’s reform and opening up and progress in China-Ireland Mutual Beneficial Strategic Partnership. He appreciated Limerick’s efforts in complying with the globalization trend and the strategy of strengthening and diversifying foreign relations and cooperation, especially with China’s local government. 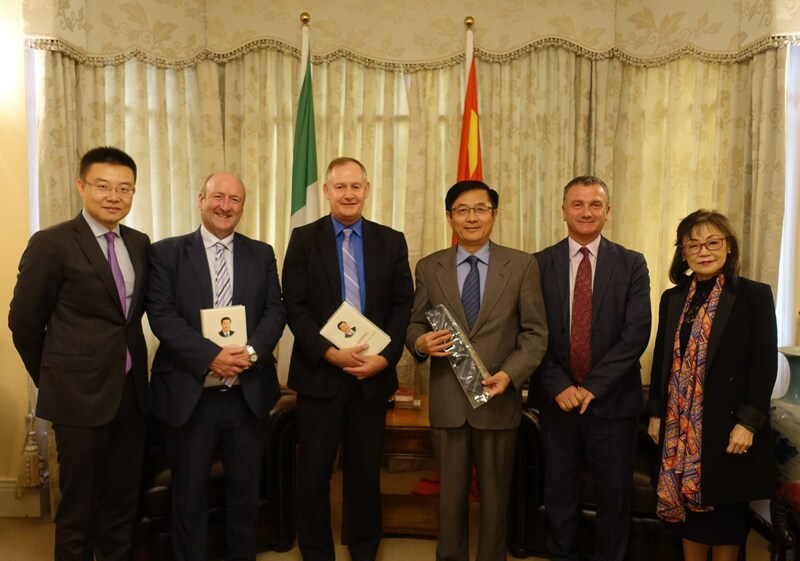 The Ambassador encouraged Limerick City and County Council to seize the opportunity of China’s developing and opening as well as the strong and positive momentum of Sino-Irish relations to carry out fruitful and win-win cooperation with its Chinese counterpart. Chinese Embassy is ready to facilitate friendly relations between Limerick and Chinese sub-national governments. Also present were Dr. Pat Daly, Deputy Chief Executive and Director of Services for Economic Development of Limerick City and County Council, Mr. Pat Fitzgerald, Senior Executive Officer of Economic Development of Limerick City and County Council, and Dr Katherine Chan Mullen, Permanent President of Chinese Association in Ireland, Mr. Shen Mingchun, Chief of the Political and Press Section from the Embassy.